The Western Australian SPE section recently held its Annual General Meeting (AGM) on Thursday 14th July, 2016. This meeting was held in conjunction with the regular monthly Technical Luncheon Seminars hosted by the section. 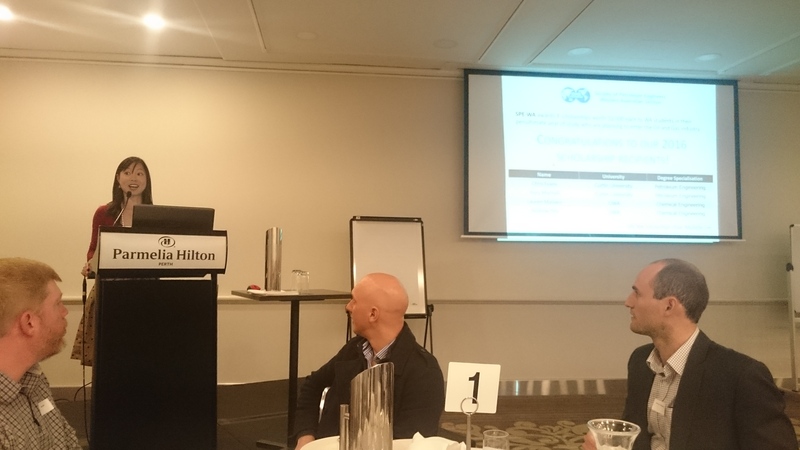 During the AGM, Stephanie Lim (Total E&P, 2015-2016 SPE WA Section Chair) provided a summary of the 2015-2016 WA chapter performance to 65 local attendees. Stephanie highlighted the section’s success and awarded scholarships to student recipients from WA. Over the last financial year, SPE WA held 27 technical presentations, a golf day, fund-raising ball, gala dinner and various other networking initiatives. Stephanie also thanked the sponsor companies who assisted SPE WA. Afterwards, Daniel shared a preview of the year ahead for the chapter and promoted the upcoming APOGCE conference in Perth, October 2016. The slides shared during the AGM are available here. Following the AGM, Chris Fair (Oilfield Data Services Inc.) provided a technical presentation on the topic of “Using Automated Reservoir and Production Engineering Tools to Make Quicker Decisions.” Chris explained how the automation of production data cataloguing can save time for engineers, allowing a bigger focus on the fundamental analysis and interpretation of data. Slides from Chris’ lecture.